Mumbai Metro One’s 11.4 Km Versova – Andheri – Ghatkopar (VAG) Metro corridor is Mumbai’s first Metro Rail Network. 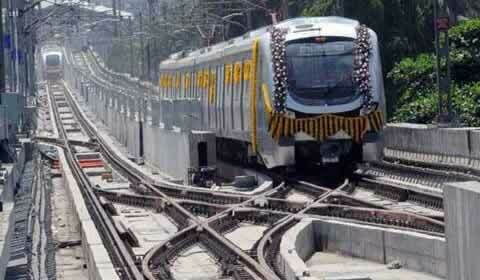 Mumbai Metro from Versowa to Ghatkopar was inaugurated on 8 June, 2014. The busiest Versova-Andheri-Ghatkopar (VAG) Metro train station is Ghatkopar (around 100,000 passengers) followed by Andheri, Saki Naka, Marol Naka, Chakala, WEH, Airport Road, DN Nagar, Versova, Azad Nagar, Asalpha, Jagruti Nagar. With the linking of the Andheri Metro and Andheri Western/Harbor Railway Stations, traffic on this Metro line is expected to further increase. Mumbai Metro single journey ticket price is Rs 10 to Rs 40. Passengers with pay only Rs 10 to Rs 32 for these tickets. Metro “Store Value Pass” (Smartcard) holders pay only Rs 18 (for Rs 20 ticket), Rs 27 (instead of Rs 30) and Rs 32 (instead of Rs 40). Reliance Mumbai Metro passengers get a discount for same day Return tickets. Price of the Metro Return Ticket ranges from Rs 20 to Rs 60. The cheapest way to travel on the Reliance Versowa-Andheri-Ghatkopar Mumbai Metro is with a 45 Trip Pass. Passengers can make 45 single trips in a 30 day period from the date of issue or reload. 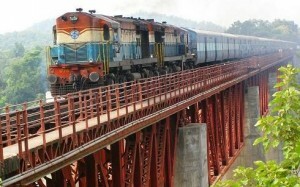 Price of the 45 Trip Pass ranges from Rs 675 to Rs 900. Mumbai Metro One Pvt Ltd (MMOPL), the operators of Mumbai VAG Metro want the ticket prices to range from Rs 10 to Rs 110, but public pressure and court judgement have kept Metro ticket prices under control. Mumbai Metro offers commuters single ticket (with magnetic token) and contact less smart cards (stored value cards) for multiple journeys. Mumbai Metro starts at 5:20 am and closes around midnight. First VAG Mumbai Metro train from Versova starts at 5:20 am and from Ghatkopar at 5:29 am. Last VAG Mumbai Metro train from Versova leaves at 11:20 pm and from Ghatkopar at 11:46 pm. Frequency of Mumbai VAG (Versova – Andheri – Ghatkopar) Metro is 4 minutes during peak hours and 8 minutes during non-peak hours. Peak time is from 8:00 am to 11:30 am and from 5:30 pm to 7:30 pm. 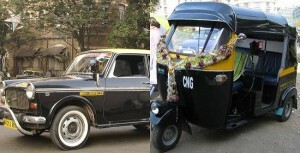 Travel time from Versova to Ghatkopar (W) is only 21 minutes. Average speed of Mumbai Versova – Andheri – Ghatkopar Metro train is 33 Km per hour. Top speed is 80 Kmph. MMOPL has 16 trains with 4 coaches per train/rake/car. All Metro coaches are air-conditioned. Each 4 coach train (or rake) has the capacity to carry 1,178 passengers. Later VAG Metro 1 trains will have 6 coaches with a capacity of 1,650 passengers. There are 270 to 280 services daily on Mumbai Metro One. It is estimated that daily 700,000 commuters will use Versowa – Andheri – Ghatkopar Metro. The coaches for VAG Mumbai Metro 1 are made by Chinese firm CSR Nanjing. Versova – Andheri – Ghatkopar Metro Railway Corridor is also referred to as VAG Metro Line or Line 1 or Mumbai Metro One. The Versova-Andheri-Ghatkopar Mumbai Metro is constructed and operated by Mumbai Metro One Pvt Ltd (MMOPL). MMOPL is a partnership between Reliance Infrastructure Ltd (69% share) (part of the Anil Dhirubhai Ambani Group), France’s Veolia Transport RATP Asia (5% share) and Mumbai Metropolitan Region Development Authority (26% share) (MMRDA). Mumbai Metro One’s Versova – Andheri – Ghatkopar Corridor is the first Metro Line in the 146 Km Mass Rapid Transit System (MRTS) which is planned for Mumbai. Eventually, Mumbai will have 8 Metro lines. VAG Metro Line 1 is the first Metro project in India based on the “Public Private Partnership” (PPP) model. Mumbai Metro trains have an event recorder that is similar to a Black Box on a plane. There is video recording in all Mumbai Metro One coaches. Mumbai Metro coaches and rakes are made of fire retardant material. Mumbai (VAG) Metro has 95 escalators and 137 staircases. Mumbai Metro’s Versova Depot is the first “U” shaped depot in the world. The remarkable Mumbai Metro Bridge over the Western Express Highway (near Andheri) is the highest cable-stayed Metro Bridge in Asia. Signaling cables used in Mumbai Metro are over 500 Km long, which is the distance between Mumbai and Ahmedabad. Power cables used in Mumbai Metro are 173 Km, which is more than the distance between Mumbai and Pune. 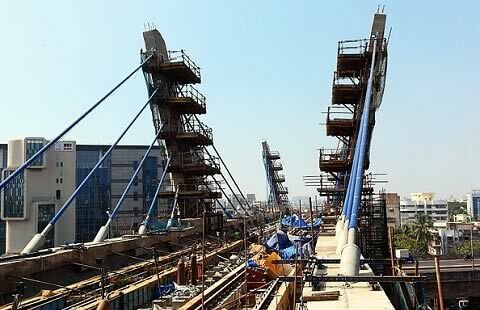 67,700 metric tonnes of steel and 370,000 cubic meters of concrete was used in the construction of Mumbai Metro. The final cost of the VAG Metro Line 1 is estimated at Rs 3,893 crore. The project was allotted to MMOPL in March 2007 by MMRDA. The original cost of the VAG Metro was Rs 2,356 crore. The revised cost of Mumbai Metro One (VAG) is Rs 4,321 crore. Government has provided Viability Gap Funding of Rs 650 crore for Mumbai Metro project. Prime Minister, Dr Manmohan Singh, performed the foundation laying ceremony for Mumbai Metro on 21 June, 2006. VAG Metro Line 1 was to be completed by July, 2010. The next deadline was March, 2012. According to MMOPL, MMRDA is primarily responsible for the escalation in cost and delay in implementation. MMRDA was to acquire land for the project by December, 2008. Complete land for the project was handed over only in December, 2011. In addition to land acquisition, other challenges in the construction of Mumbai’s first Metro rail network were unavailability of utility maps, construction in congested areas and construction of bridge over Mumbai’s Suburban rail network. Accidents and Deaths on Mumbai’s Suburban Local Trains. Image of Mumbai Metro Train and Track: Image taken from Wikimedia Commons. Image by Mumbai Metropolitan Region Development Authority (MMRDA). MMRDA allows material featured on their website to be reproduced free of charge in any format or media without requiring specific permission. Image gas been altered. Image of Mumbai Metro One Logo: Image taken from Wikimedia Commons. Image gas been altered. Image of Western Express Highway Bridge: Image by Ramnath Bhat. Image licensed under the Creative Commons Attribution 2.0 Generic license. Image gas been altered.